This unique Padilla Stoneware 16 oz Soup or Latte Cup would make a great serving piece for your favorite soup or latte. Makes a great gift for friends and family. 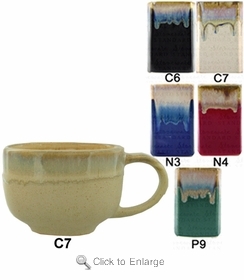 Padilla makes this stoneware cup in 5 different colors with his unusual drip-looking glaze. Approximate dimensions (l x w x h): 6.25" X 4.5" X 3.25"